If anyone would like these, please let me know in the comments, or send me an email (I have a contact form on my sidebar). Canada Post offers free shipping in Canada for people with business accounts, every Tuesday in October, so I'm taking advantage of that since both Alex and I have a business account!! They are used but in great condition! They are doubles that I have and I'll tell you, I use them all the time, the recipes overall are wonderful! I'll pick the winner on Sunday October 7th!!! :) Please check back then, I'll announce the winner on that day!!! Today's Scribble Picnic theme is "Chicken". (please follow the link for more scribbles or to join!) 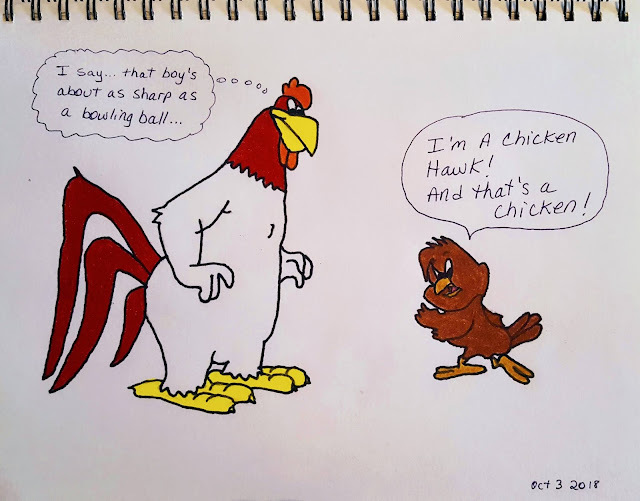 The first chicken that came to mind was Foghorn Leghorn trying to convince Henery Hawk that he really isn't a chicken! I've been so busy over the summer that I haven't done too much art, but now I'm really getting into it! 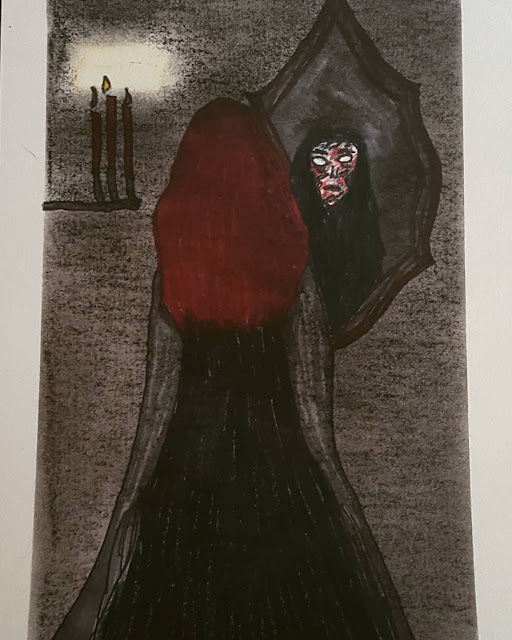 Bloody Mary: Bloody Mary will appear on certain nights when her name is spoken three times in front of a mirror. She is an evil spirit who may foretell the future, but at the cost of your life! La Llorona: La Llorona is the ghost of a woman whose children were lost. 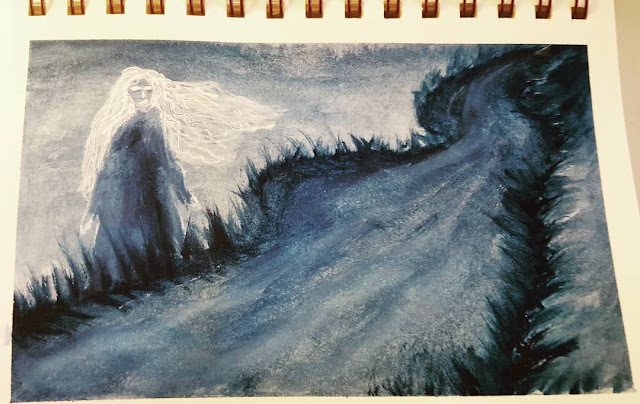 She haunts the river beds, moaning and searching for them. Beware those who hear her cries or cross her path for she will bring great misfortune to you! "The Ghost of Banquo": In Shakespeare's Macbeth, Macbeth has his friend Banquo murdered for fear that Banquo will take the crown from him. 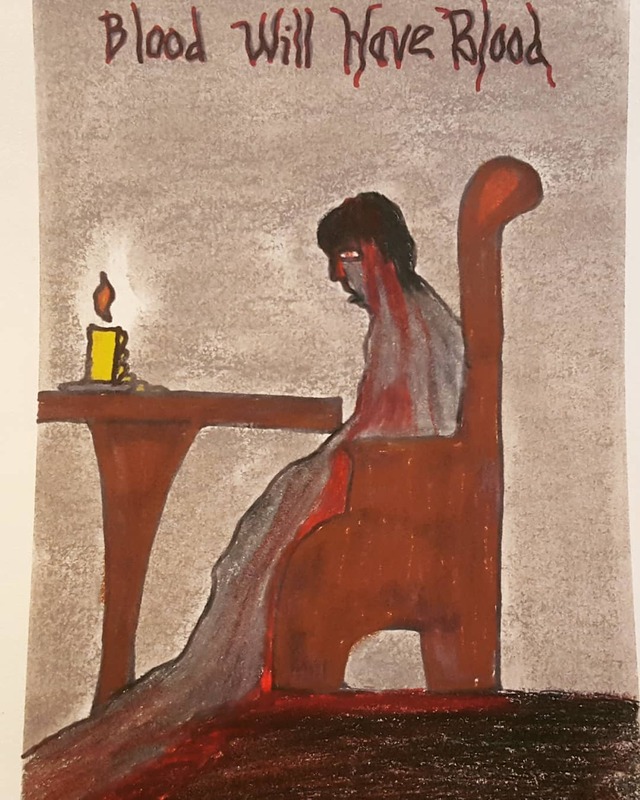 After appearing at Macbeth's banquet in ghost form, Banquo foretells the omen "Blood will have blood." I love your comics! I drew Foghorn as a greeting card for my son last year and I totally forgot to snap a picture of it before mailing it off to him. Man, I hated that didn't do that! I ought to sketch another just for the fun of it. 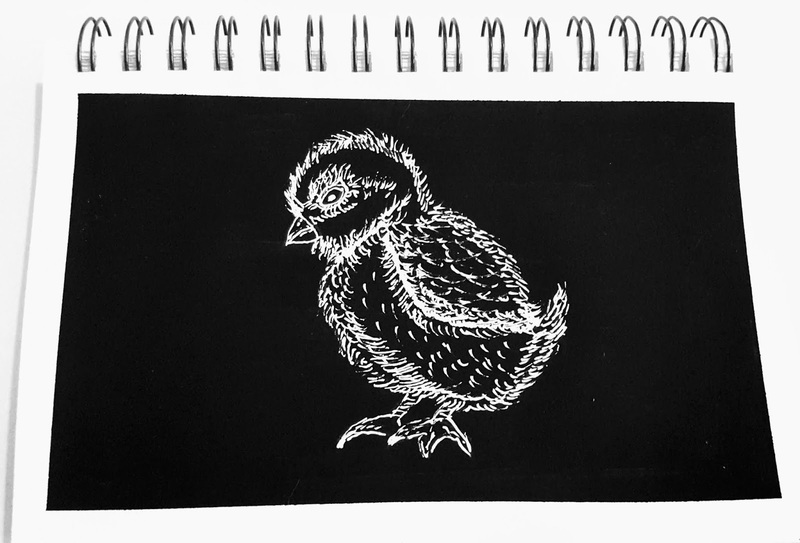 At some point in the coming months, I may replace my weekly photo contribution with more sketches. I most of my WW posts done until the end of the year, so I'm not going to mess with them much other than adding the Scribbles artwork and ABCWednesday. I'm ready to change things up starting after the New Year. 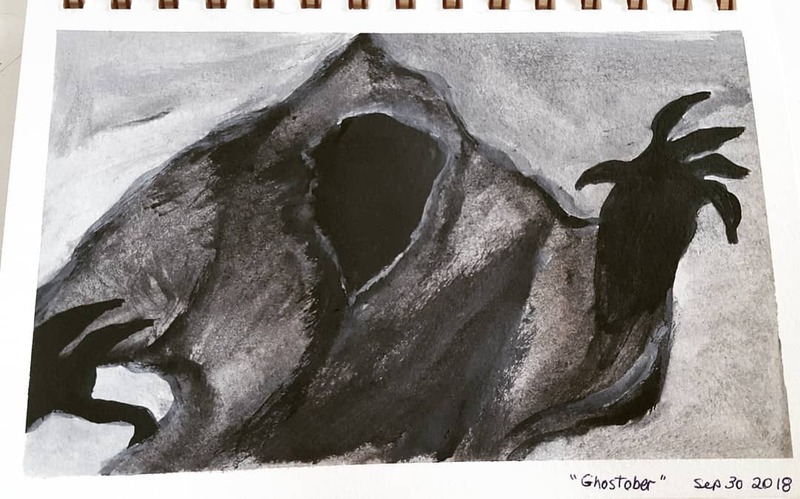 Your Ghostober series is very cool! The only thing spooky I've drawn is of a Zombie in 2017 A to Z challenge. :) It looks like you're having such fun. I'm ready to have more fun illustrating, too. 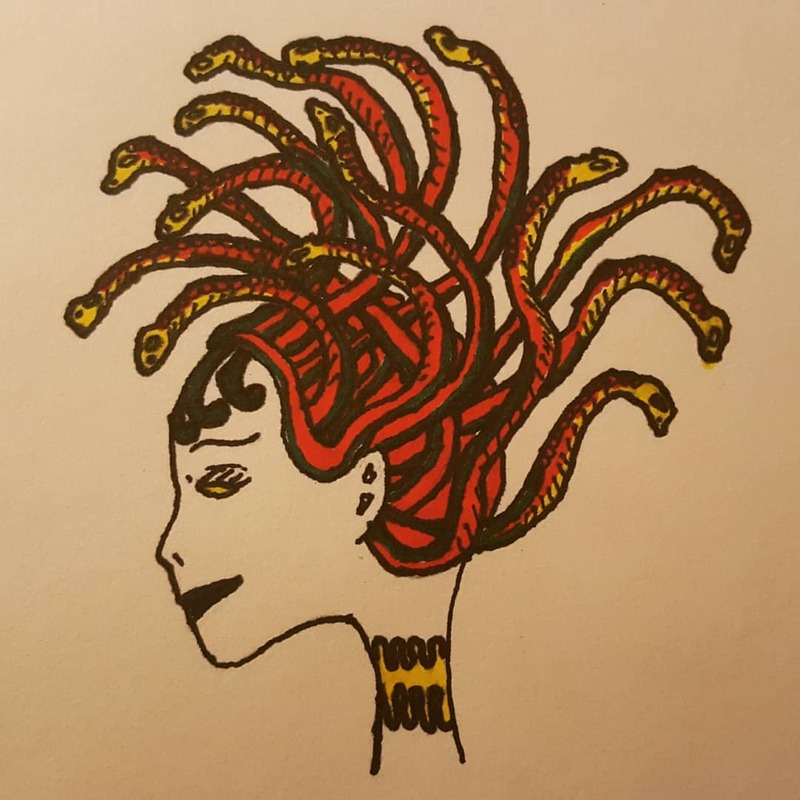 I love seeing all the art you’ve been doing! How talented you are! My niece has worked in the haunt industry and we have a mutual friend who goes across the country teaching about haunt things. I had no idea it was such a huge year round industry! Enjoy your movies and this October full of some of your favorite things and activities! Love all the art Rain! The Looney Tunes especially! I'd love to own those cookbooks...but I don't have much space!! Put me down for the giveaway anyway, I'd make room if I happen to win!! Wow, you are being productive, Rain! I won't comment on some of these as have already on your IG but seriously impressive how much you are outputting. Ha, you can tell this is definitely your time of year! I've not seen that Hyde version with Tweety Bird but, boy, does that sounds fun! And you know, I was discussing with Alex that foghorn Leghorn reminds me of the good ol boys here in KY! Whoa. too funny. I love that, "I'm a chicken hawk and that's a chicken" comment too. Too cute. Love all these. Thank you so much. Yes to the cookbooks, Williams Sonoma, wow, thanks for this offer/chance. And your chicken pieces are so fun and beautiful along with your other art. 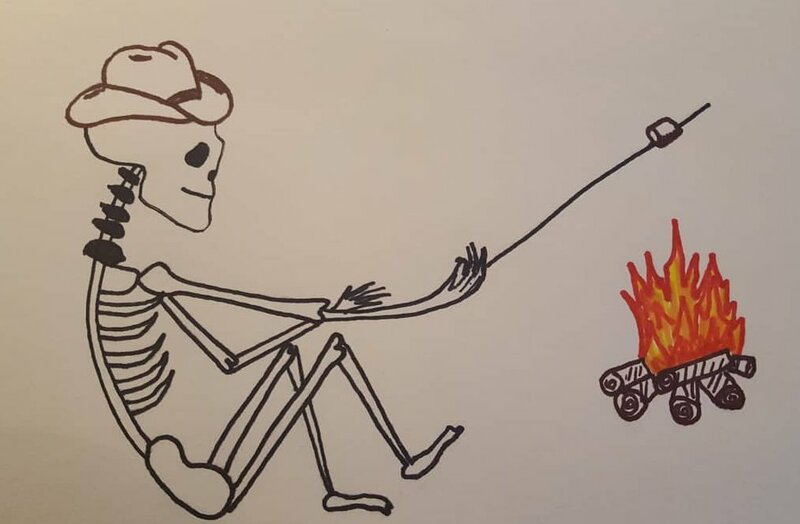 I like the spooky Death Dude. WOW! You have been a busy girl! Ah yes, I remember the Tweet and Hyde one...haha I love all the art sketches you've done, not only for Scribble Picnic, but also the Instagram challenges. Well done, YOU! I saw that Canada Post was offering free shipping! Amazing! I would love love love any of those great cook books!! I totally enjoy see all your Inktober creations as well as your ghost series. I'm still afraid, after all these years since telling ghost stories as a teen, to look in the mirror at midnight! Such fun drawings. Looks like you are having a good time doing art. Lovely of you to share your books with someone else. Wow, you have not wasted your time.. very productive.. and so much fun!!!! I might try drawing someday. Wow...you have been busy with the pencils and paints! Love it all. Yep....we had lots of rain last week, was glad it all moved out. Cooler temps here but not cool enough for me yet....but then again not looking forward to CoLd! Stay warm, kick back, enjoy your movies, sat well and love on the furbabes.....keep drawing! You are having some well deserved art fun!!!!!! 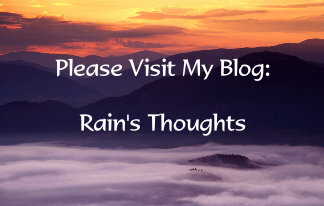 I would love to be entered into the giveaway Rain! Very kind of you! Thank you! You are rocking it with the art girl! Wow! 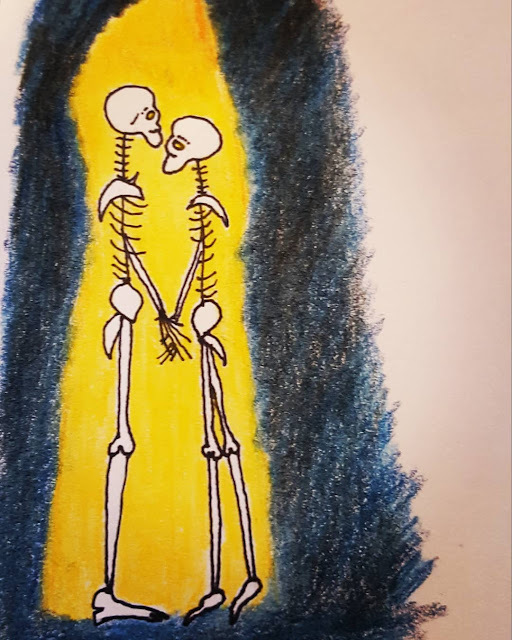 I have to say, the skeletons holding hands, took my heart away! I think it's so special! Jack looks so cute all cuddled up in bed! It's cool here too! Happy Thanksgiving! Mom will be making her pumpkin goodies soon. Not sure what meat? We might have ham. I was going to say please enter my name as 2nd Man would love those books for his collection but I found an online CA to US parcel calculator. Yikes, LOL! The artwork is amazing. Such a talent, one I wish I had. If could have any talent it would be a tie between art and singing. Maybe both, the singing artist? Ha!!! your drawings always reminds me of the cartoons I used to watch. I don't remember seeing hyde-tweety-bird. poor sylvester. you've captured them just right. I'm not really a fan of halloween so I'm not sure I like those drawings but it is fitting for this month. You just keep getting better and better with your drawings! Your creepy ones are truly creepy too! The cookbooks look good but I need another cookbook like I need a hole in the head. Lucky you with the cool/cold temps. It is st in the high 80's low 90's here....ick! I started watching some classic horror movies to get in the spirit of Halloween. Last night it was The Invisible Man. Jack sure looks comfortable! Have a great week! Hi Cathy :) Thank you! I love sketching the Looney Tunes. You can do so much with them! :) Your photographs are beautiful, I hope you do add some sketches for the Scribble Picnic! :) Oh yeah, I'm having fun with the ghosts and ghouls!!! :) Have a great week yourself!! Thanks Serena :) It's nice to have the time for art again. The summer here was just so busy and fun! Tweety Bird as Mr. Hyde is just too scary for me lol! Thanks Lorraine :) I'm a little scared of looking in a mirror at night too. I always have to have some kind of light on! Thanks Martha :) You're always so supportive of my art! :) I have done a lot of canning and preserving and I'm so happy about it. When we're settled, I'm going to make it a full time effort to stock up enough stuff so we don't have to do much shopping over the winters any more! You are in the draw :) Oh, I thought about dividing the books up, but they are just such a nice set together! Thanks Pam :) It's definitely robe and slippers weather here! We are spending LOTS of time cuddling with the 6 pets, watching movies under the covers! Thanks Stacy :) Yes! You are in the draw! :) Happy Thanksgiving to you too! :) I was going to get turkey, but we have a chicken in the freezer, so I'll be making that instead. I can't wait for the feast!! 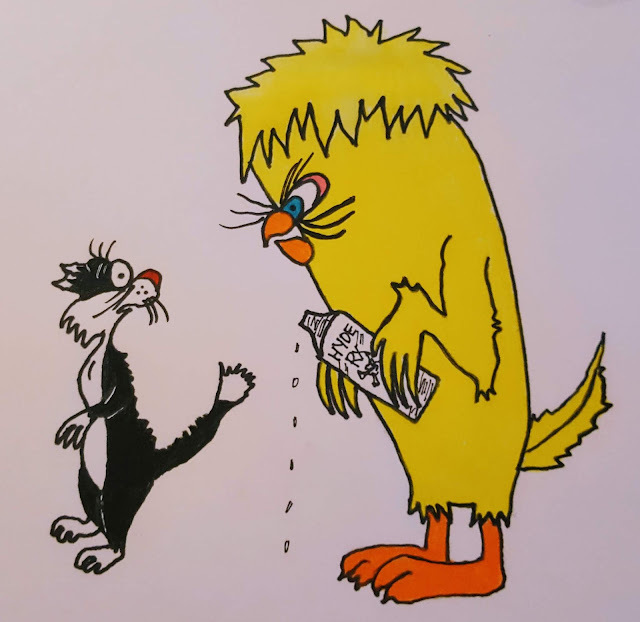 Thanks Lissa :) Poor Sylvester is right...I remember watching the cartoon and hearing him do a big "gulp" when he sees Tweety Bird so big and scary! 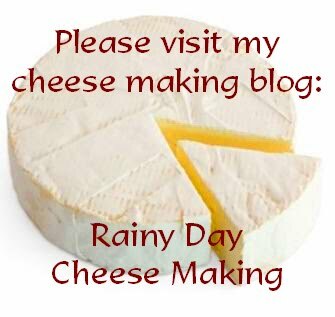 "Wow" is all I can say Rain - how will you ever have time to make cheese with all this art going on, haha! Love - enjoy the weekend. RAIN- No, having chicken pox does not protect you, from shingles. "Shingles is caused by the varicella-zoster virus — the same virus that causes chickenpox. Anyone who's had chickenpox may develop shingles. After you recover from chickenpox, the virus can enter your nervous system and lie dormant for years." That is some giveaway. You are so brave to watch horror movies. I like your skeleton drawings and the second chick one! Wow you are incredible artist dear Rain! enjoyed all your work specially the bloody marry oooh! your love and excitement for everything you do is mesmerizing honestly! glad you are happy with cold weather my friend!